In the midst of all the running around this time of year for Cheeleading competitions and practices, Brittany and her squad are still cheerleaders, and have to cheer at every Jr. Midget game. The boys have a really good squad this year, and have been marching their own way in the post season. Yesterday, Milford beat Naugatuck 22-20 to advance to the Southern Connecticut championship game. 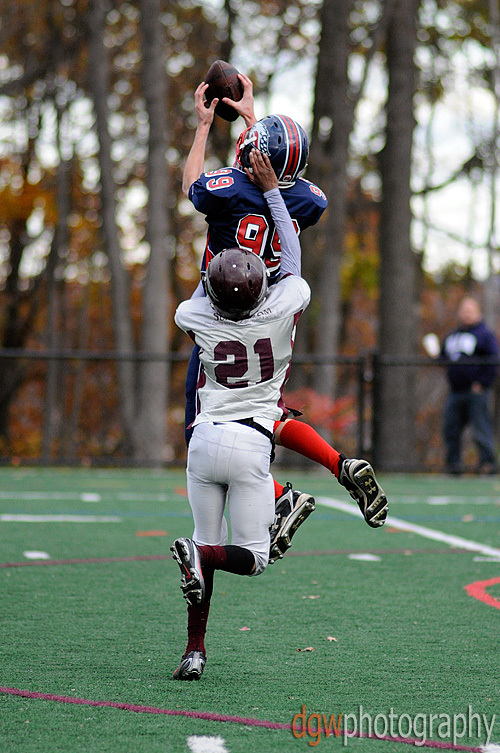 Above, Jake Kasuba catches what turns out to be the winning touchdown in the fourth quarter. This is a case of anticipating the play - I saw him split out wide to the right, and knew that the ball would be coming to him, so I followed him from the line of scrimmage all through his pass route.